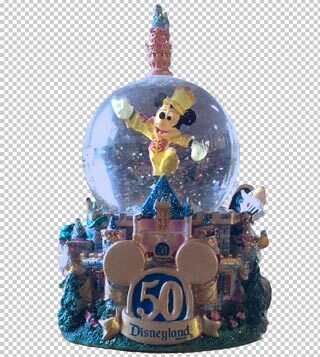 Recently I was charmed by a friends’ Disneyland 50th Anniversary snow-globe. I shot a snippet of video of the tiny glass sphere on my phone, and later at home was inspired to further edit the video – maybe add a different background and a more appealing audio track. 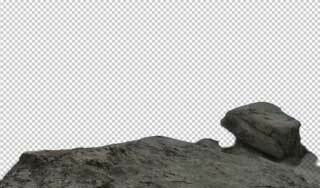 First, from Adobe Bridge (or, Lightroom), I dragged and dropped the .mov file into Photoshop, creating a new Photoshop document. 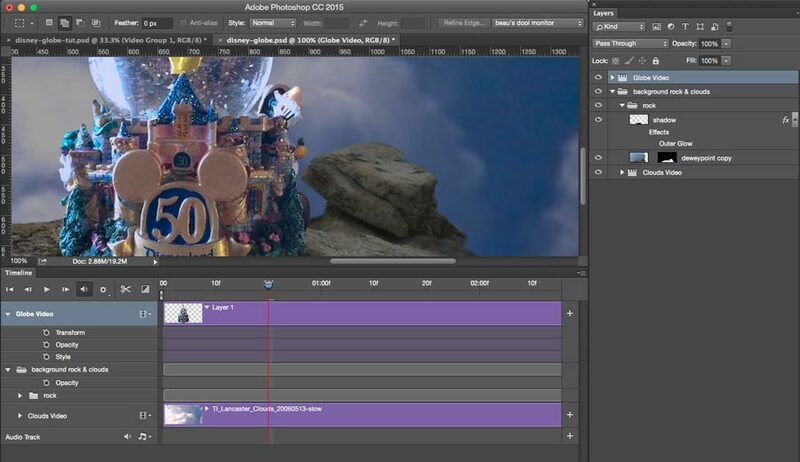 I selected all of the video layer (by either clicking the video layer in the Timeline panel and typing ‘command+a’, or, by command-clicking the video’s icon in the Layer panel), then went to Edit > Copy Merged. Next, I typed ‘Command + v’, and created a new (raster) layer, but it needed dragging above (and, outside of) the video group. I resized the canvas to a landscape orientation, to dimensions more Youtuby than the original phone video. I also needed a new surface on which to place the globe, so I dug up an old snapshot of Dewy Point, and masked out the background clouds. With a bit of shadow effect and some Photo and Exposure Filters added, I choose File > Export > Render Video, fiddle with the setting, and I’m ready to take the resulting .mp4 file into Premiere Pro. 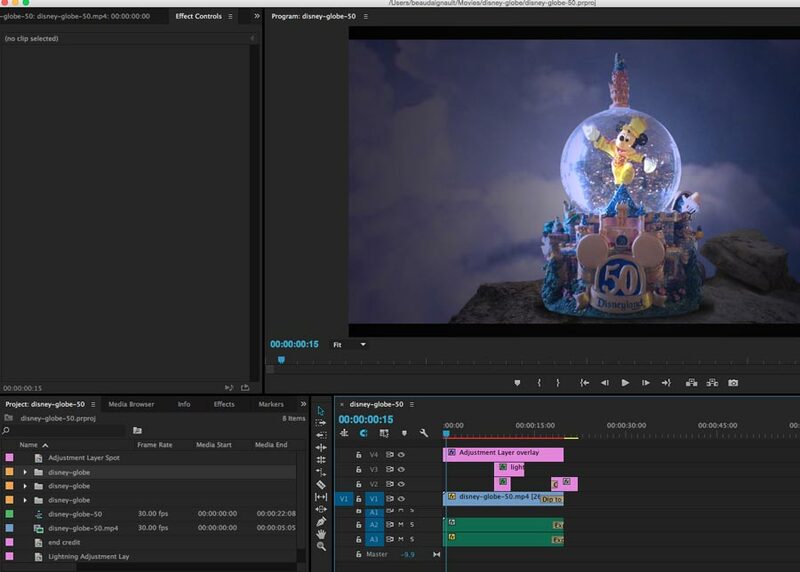 In Premiere Pro, I import my assets, being: the Disney Globe .mp4, and two audio tracks (organ track and rain/thunder track). Big high-fives to the Free Music Archive and the Internet Archive. 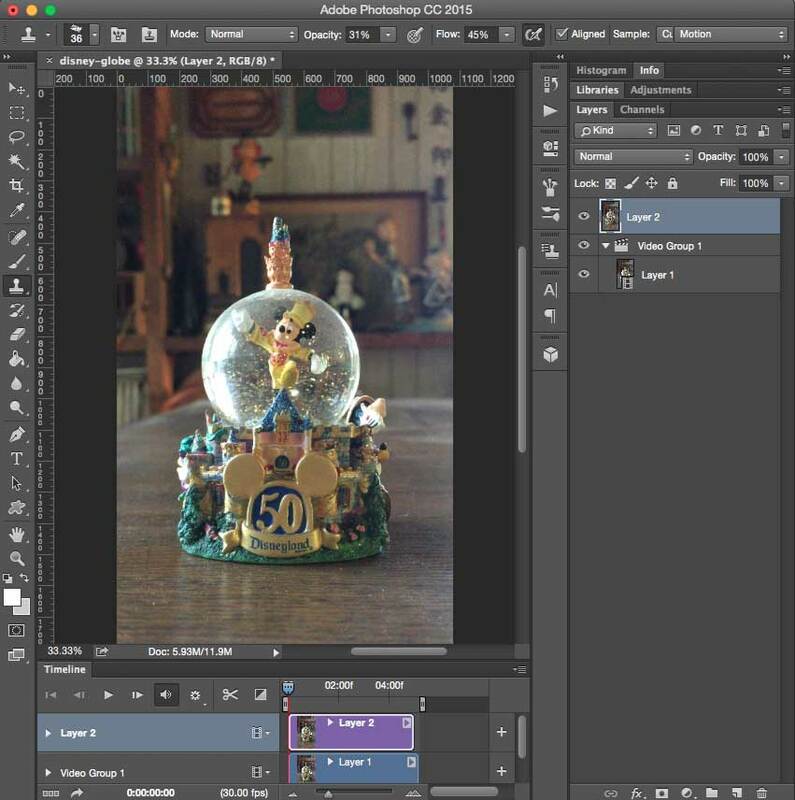 How clever of you to make a post out of a snow globe, so imaginative and creative! I so like it.